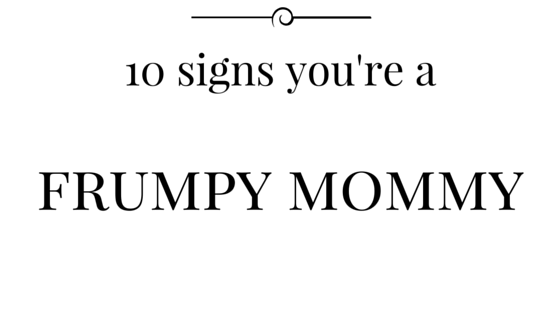 This list is brought to you by my frumpy morning. You're wearing a headband (of the 'workout' variety) - I get it, you haven't showered and there's no time to do your hair. I've been there and done that. My advice? Get one of those fashionable wraps or find your go-to quasi-stylish up-do (plain old ponytail doesn't count). You cannot remember when you last showered - guilty. Make a rule, for me to feel like a somewhat functional adult I need to shower every __ days (probably wanna keep that number as low as possible, no one wants to be the smelly mom). If you had to do the 'smell check' on any item of clothing you're wearing - don't pretend you haven't done it! Checking for b.o., spitup/puke, baby poop? It happens, just admit what you're doing is wrong and move on (oh, and DON'T put it on! If you have to smell it, don't put it on - unless you really want to leave yourself open for an awkward moment later). You're carrying a diaper bag when you're out... without the baby. - I know, you have a $300 designer diaper bag, that's amazing but guess what? It's got stuff in it for wiping asses! Do you really want your baby's bum balm to fall out while you're trying to pay for a cocktail? No. Just no. You very likely forgot to brush your teeth and put deodorant on - nothing you can do about it now. Throw in a piece of gum and rub the car air-freshener on your shirt. You have previously worn your outfit to gym or to bed - I get it, you want to be comfortable and there's nothing better than yoga pants or pjs. Unless you're going straight to bed or to fun a 10k, swap your pjs for some leggings and a cute tunic. Trust me. Sidenote: leggings are NOT pants, accompanying shirt must cover your lady bits. The label of your clothing has "maternity" in the title - those cute maternity jeans you're still rocking 4 months after your baby was born are NOT doing you any favors. Trust me when I say you will look AND feel better in clothes that fit your new post-baby body. You spent more time dressing and coordinating your child than yourself - yes, your child is adorable this morning! Her shirt matches her socks and the boy in her hair... guess what? She's making you look bad. You got a toddler to agree to wear the outfit you picked out and matching accessories, you got this, now go put on some mascara. I LOL'ed at a lot of this list and totally related. Especially to wearing my "gym clothes" as an outfit for the entire day. somehow I can't picture you looking frumpy but I guess we all start somewhere! As I'm still in pajamas!